Three college kids end up lost on skid row. After they get a flat they ended hunted by the homeless and dregs of society living in the area. Writer/director Chad Ferrin says that the film is based upon John Colter’s capture and escape from a ferocious Blackfeet tribe in 1809. It would have been easier to say that this is kind of urban remake of NAKED PREY done in the style of low budget 1980's exploitation films. Saying it's based on Colter's escape gives the film a pretense that the film simply can't sustain. 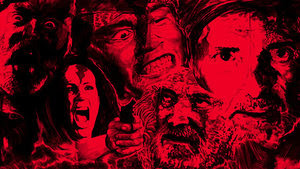 For get the social commentary, for get the historical connection and just take this film on the terms it works best a throw back retread of the sort of things that closed out the drive-ins and grindhouses before VHS killed them. This is a low budget film about a bunch of "monsters" hunting a privileged sort of person and leaving a trail of dead bodies along the way. High art this is not, an enjoyable popcorn flick for a rainy afternoon or midnight screening it is. See it as that and you'll have a good time- as anything else you'll ruin the fun.